Hi - not sure if this is happening to anyone else in the neighborhood, but twice now I have had bags of dog poop left in my yard by the front curb. This last time, the person actually took pine straw to try and cover the TWO bags of poop they left in my yard. 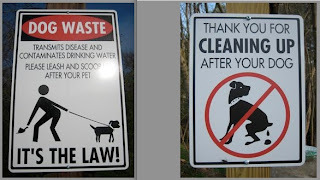 Ah, yes... with the many joys of dog ownership also comes the issue of responsibly disposing of an awesome amount of poop (hereafter referred to as "it"). Many dog owners struggle with the odoriferous paradox of grabbing a biodegradable object, wrapping it in plastic, walking with it for half a mile or more, and sending it to the landfill. But there are good reasons to do so, and many alternatives. The obvious reason are aesthetics and hygiene. Nobody wants to accidentally step in dog feces while enjoying a public space and possibly track such things into the car or house. Because pet feces may contain parasites transmittable to both pets and humans, and there is no way to know the health status of the source, it is understandable that uncollected pet feces cause anxiety to many (in particular to those with small children and young pets, or individuals with suppressed immune systems). This is particularly true when the offending pet (supervised or not) has trespassed into private property, and the home owner has reasonable expectation about what to expect (or not expect!) in their own yard. There is also a concern about water quality and health. Feces may contribute to a process called eutrophication, which simply means enriching the nutrient content of a body of water. Although this may sound like a good thing, it is not: the added nutrients can increase the growth of microorganisms and algae, and otherwise change the chemical composition of the water. As algal growth increases, the amount of oxygen available in the water can decrease. These changes can seriously impact native water-dwelling species. Mosquitos, however, can weather or even benefit from the process: their larvae feed on algae and other microorganisms, and mosquito larvae are able to swim to the surface to get the oxygen they need. This is a long way of saying that the poop you leave behind near one of our neighborhood creeks may nurture the very mosquitoes that will bite you a few weeks later. Given that mosquito-borne diseases threaten both humans and dogs and cats, and that feces may contain bacteria that can contaminate drinking water sources, proper disposal is particularly important near waterways. Bag stations, and extremely clear signage!, can be seen along the Medlock Park creek path. collect & dispose of it: Repurpose plastic grocery and newspaper bags, and then deposit them in your trash. Another option is to purchase biodegradable bags. Since small bags dropped into the larger outdoor trashcan can be problematic (because they may not make it into the truck when the County empties curbside trashcans), consider a small, dedicated trash can for this purpose. Empty kitty litter containers work well: they have a lid, you can usually pick them up for free from cat-owning neighbors, and if you use a plastic bag for a liner, you can reuse it forever. flush it: yes, you can flush it (not the plastic bag, of course!) when you get home. The water treatment facility will handle it much as it does, well, everything else we flush. Some biodegradable bags are advertised as being flushable: consider whether your home's plumbing can handle these, and be aware that flushing pet waste is not recommended for those using septic tanks. 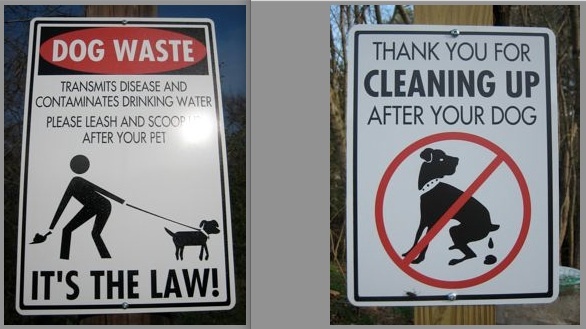 let it decompose at home: whether you bring it home with you or train your dog to poop on command before your walk, it is possible to allow your dog's feces to decompose in your own property (assuming doing so does not create water contamination or sanitation concerns). There are commercially produced in-ground doggie doo composters, and DIY instructions for making them using a plastic trash can. Depending on your yard layout, you may be able to allow dog feces to naturally and safely decompose in an out-of-the-way area. One simple system entails designating a mulched area as a composting zone. Begin by moving some mulch aside, depositing the "item" then replacing the mulch; a discrete marker tells you where the last "deposit" was made. By moving in an orderly progression that makes sense to you, by the time you loop back to the "start", your local soil critters will have taken care of things. If you intend to handle any ensuing compost, (including worm-assisted compost), please understand the health concerns associated with compost that does not reach the high temperatures necessary to kill parasites and bacteria. This, unfortunately, is the likely scenario for most backyard compost heaps. 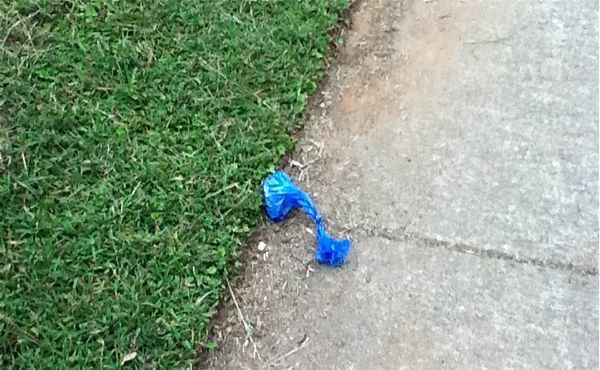 Seen one Sunday morning on Wood Trail Lane: we can do better, yes? But I don't want to "carry it" for a mile. If pre-emptive "command performance" training is not your style (nor your dog's), and you don't fear the fashion police, there is an easy solution: a waist pack. These packs are particularly convenient for those with multiple dogs and larger dogs. If you get one with multiple pockets, you can designate a section for "it business" and another for extra bags, keys and treats (or other items you might want during your walk, such as a cell phone, binoculars, small flashlight, camera, spare leash, and possibly even a water bottle for your pet). A waist pack also offers night walkers a convenient attachment point for a safety light. Store your doggie doo pack next to your dog leash to increase the odds that you'll leave the house prepared. Don't be surprised if you walk longer or enjoy the walk more now that you aren't left "holding the bag"! For added peace of mind, line the designated "it" compartment with a plastic bag. To protect yourself from "the smellies", zip the "it" compartment once occupied. Wearing the (occupied) bag so it rests on the small of your back pretty much guarantees your nose will be sheltered from unpleasant winds. Store your pack with the "it" pocket unzipped for added freshness.